Granted, we purchased the green version – which I think is the cheapo Target model (sorry, Target, I love ya, but this was not one of your finer merchandising moves) – which has a rubber rope instead of a real rope, but still. I doubt it would have made much of a difference. Here’s a photo of that rubber rope. The design has some good features. 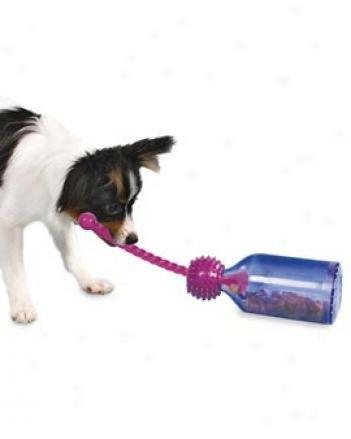 You easily fill the bottle with treats and/or your dog’s dinner by unscrewing the bottom. 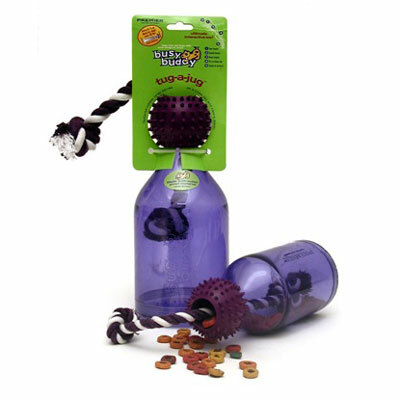 I guess some dogs (particularly the rope-tugging fiends) would be great at getting the treats out of the bottle. Teton, however, was not. In fact, he looked nothing like this dog. No, my friends. It was painful watching him try to get the treats out of the bottle. It’s not as easy as it looks! You see, to get treats to fall out of the small gap between the rope and the bottle opening, your dog has to tug the rope in a very particular manner that may not come easily to dogs without experience playing tug. Honestly, it was even hard for me to get treats to come out! 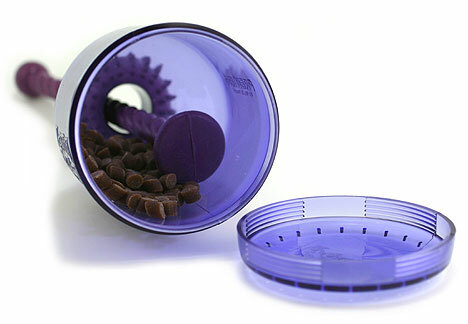 I’m guessing that other Dog Moms and Dads have had success with this treat dispenser. We’ll stick with Premier’s Twist ‘N Treat. Thank goodness Target’s return policy rocks. So, Dog Mas and Pas…lets hear it. Anyone out there just love the Tug-a-Jug? Posted on March 10, 2011 May 14, 2011 by Shannon	This entry was posted in Toy Chest. Bookmark the permalink. I bought this one a while back…pretty spendy…thinking it would be the perfect toy for Tatum since she LOVES to play tug-a-war. She lost interest VERY quickly because she could not get any treats out either. Then, she got so frusterated that she started chewing on the bottle itself. I was told that the bottle was made of “bullet proof” plastic so I was not too concerned…T had the thing destroyed in 20 minutes. $15 down the drain. I’m so glad it wasn’t just us! Of course, I did hear that some people’s dogs LOVE the Tug-a-Jug. I’m with you, though. Have you tried any other products from Premier Pets? I actually purchased two of these when I found them at homegoods. I originally got the large version for Bear, my chow pup. I thought it was too big..and that’s why the treats weren’t falling out… so I went and bought him the small one. Alas, that didn’t make a difference. These were also the ones with the rubber ropes… but as you said… it was hard for me to get the treats out. And we’re a non-tugging group… so ehhh… we still have them for whenever I feel like playing with him with them… but I don’t like this one to keep him occupied. I guess we’re both non-tugging groups! Have you tried any other interactive toys that you’ve had success with? 1. Make sure you use the right size treats (many fit it). 2. Actually teach/work with your dog at first and they will get it. The rubber rope stinks. They don’t make it like that anymore. We were just thinking of getting this for our Jug, thanks for heads up!